For me, the day my father celebrated his 85th birthday was particularly poignant. He had had metastatic cancer, two hip replacements, pneumonia and numerous other hospital stays over the last 18 months. I did not think he would make the distance. In a country hall clad in peeling pressed tin, we festooned the interior with streamers and balloons. Australian wildflowers decorated the white-clothed tables, while blue pews, waiting to be filled with partygoers, lined the edges of the wooden floor. My daughter had compiled 150 photos into a movie slide show, which looped continuously as my father’s life was projected onto the wall. My son played music to the gathering crowd. The aroma of hot sausage rolls and pastries drifted in from the kitchen. On a table to the side, I stacked printed sheets of ’65 Questions To Help Remember, And Share The Wisdom Of, A Live Lived’ - a list of questions to prompt reminiscence, and relate wisdom gleaned from a person's life. I wanted to share these questions with Dad’s friends because, over the years, my father has loved answering them. He’s relished the opportunity to reflect on his life, and to pass on his thoughts and wishes to his grandchildren. Each time I asked a question, I listened carefully to encourage him to talk further, (ironically, employing the communication skills from my parenting approach!). I recorded his answers on voice memo, and am now videoing his reflections. In the future we can look back at his eyes twinkling mischievously under his bushy eyebrows, listen to his delighted laugh. And we can remember. And love fondly. Dad's friends thanked me for providing this list, and I realised that I had to share more broadly. So many people are in my position – caring for, or concerned about, aging family and friends. Wanting to make the most of the time that is left. I’ve particularly enjoyed asking my father about his favourite books or movies. He is a prolific reader, often reading a favourite book several times. When I finally read his favourite book (The Far Pavilions by M.M.Kaye), we spent many an hour discussing the vivacity of the writing, the history behind the story. I will think of Dad when I re-read that book. Or when I watch that movie. Or listen to that song. I put together this list of questions from two moving posts on Facebook: ’32 Questions to ask your father before he dies’, by Brendon Burchard and then, Rachel Macy Stafford, and added questions that I'd asked my father along the way, and which he's enjoyed answering. If you are asking these questions, you will be with someone you care about. Perhaps you could also let them know how they have impacted on your life, to thank them for being who are they are. In this compilation I have added prompts to say ‘thank you’ to your loved one. Declaring our love and our gratitude may be emotional, and difficult. The words may be hard to say, and hard to hear. But when things are left unsaid, to never be heard – this can be harder. Sadly, for many of us these questions come too late. Our loved one may have died, or be suffering from dementia, or be afflicted by the side effects of medication and are cognitively impaired. Or, our relationship with our parents may be broken irrepairably. My mother passed away from dementia. I ache to hear her strong voice, her laughter, even her scoffing, as we go through the list, one question at a time. This will never happen. But perhaps, with this list in hand, I can imagine her answers. There are many ways our parents, our grandparents, or those special people in our lives, will continue to live on for us once they have departed. We will remember their sayings and their values. We might see them in a gift they gave us, or in a crotcheted doily. 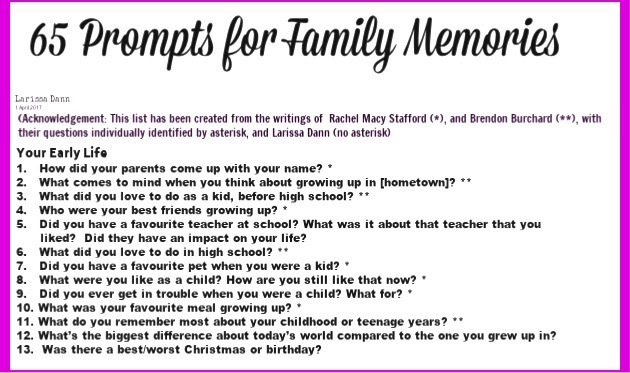 These questions will remind us of those precious moments we took to know and love the ones that shaped our lives. They are questions to begin the conversation with those still living. My father and I have just completed another long-term project of mine. In 1960 my young parents rode a motorbike from Australia to London and return - a trip virtually impossible today. Dad's photos are stunning - memories preserved on Kodachrome slides, vivid and fascinating. History in my loungeroom. I scanned a selection of the slides, then sat by his bundled form as he recollected, in astonishing detail, the place and the story behind each photo. Together, we formatted a photobook, so my father will have an accessible memory of a defining period in his life. 65 Questions To Help Remember, And Share The Wisdom Of, A Life Lived. Did you have a favourite teacher at school? What was it about that teacher that you liked? Did they have an impact on your life? What’s the biggest difference about today’s world compared to the one you grew up in? Was there a best/worst Christmas or birthday? How did they influence your life? What parts of your parents do you see in yourself? Do you see anything of your parents in me, or your grandchildren? Who were other people in your family that were important to you (such as grandparents, cousins, aunts and uncles)? Why were they important? What do you remember about them? What was a quality of my other parent that you liked (if you are now separated)? What did you love the most about being a parent? Do you have advice for your grandchildren on work? What was your favourite book/movie/song/piece of art? What did you like about that book/movie/song/piece of art? Have you created anything you’re most proud of (besides us!)? Did you have any adventures in your life? What were they? How did they shape your life? What were some of the saddest moments in your life? In what ways do you think you have touched another’s life? 1. Thank you. I am grateful for . . .
2. What I most remember and cherish about you is . . .
3. These are some of the approaches to life that I think you have passed on to us . . .
4. Here are some ways we will remember you by (sayings, humour, etc) . . .
5. I love you . . .
Further reading: A Personal Reflection on Intergenerational Parenting – my blog on aging parents. Grandparents And Grandchildren: Observations From A Parent In-Between. “Without Rewards or Punishment, What Motivates You?” Young People Raised Gently Answer Parents’ Questions. Loving Our Ailing Relatives: Still The Same, But Different. Facebook: Please join us on our Facebook page for a mix of articles on children and parenting. Refresher workshop for P.E.T. Graduates: TBA 2019. Private face-to-face sessions and course now available. Renew your PET skills; complete the full course over flexible times; or one-off parenting sessions. Please contact info@parentskills.com.au for further information. Disclaimer: The articles, blogs, testimonials and P.E.T. stories on the Parent Skills website are posted only as opinion or ideas, and are general in nature. Posted articles do not constitute advice or recommendations. The administrator suggests obtaining professional advice on any concerns (including medical or psychological) the reader may hold regarding their children, themselves, or others. The administrator takes no responsibility for any action or outcome a reader may make as a result of reading a post. The reader alone is responsible for any action they take as a result of reading this website.